Spring is here and summer is around the corner, which means it’s the time for asphalt maintenance. With the winter thaw done your asphalt might need to be cleaned, not only to keep ugly stains and tracks off your commercial property, but also to help maintain your pavement and keep it free of oil slicks and mold. Here are some tips for safe asphalt cleaning. Do use a pressure washer. When you have a large scale pavement to clean such as a commercial or municipal property, you don’t want to go scrubbing every stain by hand. Check out pressure washers that the pros use like the Yamaha Surface Cleaner. Don’t use a home made detergent. 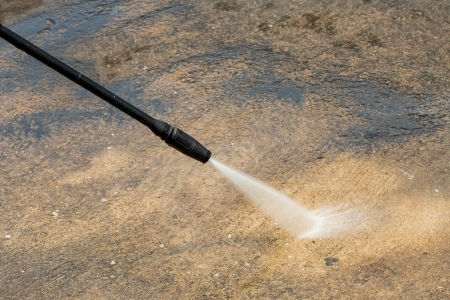 Not only could attempting a DIY detergent accidentally cause toxic fumes if you mix the wrong ingredients, but also it could damage the pressure washer and leave even more streaks and stains all over your asphalt. For proper asphalt maintenance that makes your property look as professional as it can, use an appropriate cleaner that is meant to go in a pressure washer, and on your pavement. Eye goggles and gloves are an absolute must when cleaning your own asphalt! Little chips and stones, as well as splash back from the washer could easily catch you in the eye, so safety first! Do seal all electrical outlets. If you have any extant jacks, electrical outlets, or electrical fixtures such as lamps in the area that needs to be cleaned, make sure to seal them or get them out of the way before you start cleaning. Don’t turn your washer on too much too soon. Remember that asphalt has relative give in high temperatures, so don’t hold the nozzle of the washer too close to the surface of your pavement, or turn the pressure on maximum too fast. Keep the nozzle a good foot away from the surface and on minimum pressure to start with and ease the pressure up if it needs it, while also increasing distance if you do. If you have a lot of asphalt maintenance to do for your business and no time to get your own washer and do the cleaning yourself, then call a pro – Dyke’s Paving has been one of the most trusted names in paving for the Atlanta area for over four decades, and are waiting to help you today!